Rhinoplasty or nose job is type of surgery to change the shape of the nose. Some people are not happy with the shape or appearance of their nose and try every possible way to change it. The nose has many different sub units and the nasal tip is one of it. 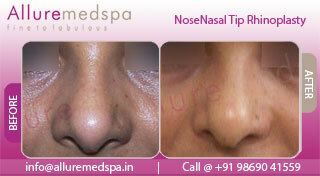 The tip of the nose can be changed with the nasal tip surgery. You have a broad nose, thick nose, crooked nose or have a hump; cosmetic plastic surgery can change it all. The tip of the nose is consisted of skin, tissues, and combined with lower lateral cartilages. Changing the lower cartilages can increase or decrease the appearance of the nasal tip. 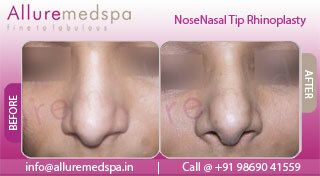 The tip of the nose has many aesthetic features that can be altered with the Nasal Tip Rhinoplasty. This process can be undertaken by anyone, be it a male, female, teenager or a child. It is a safe method with no side-effects at all. The tip of the nasal is changed using various approaches. The external approach involves making incisions on the skin between the nostrils while the internal process makes incisions inside the nostrils, which is not visible at all. The Nose Job surgery takes only a day to complete, where in you will have to be accompanied by a friend or relative of yours. Initially you might feel a little bit of drowsiness or pain that will fade away in certain weeks. However, one will have to be really careful of washing too much of face, blowing your nose or wearing of tight glasses. For faster recovery, it is really important to follow doctor’s instructions. You will get a full proof result after a month of the Rhinoplasty surgery, when the healing process is completely done. During the process local anesthesia is required to be inserted so that pain and discomfort is receded. It will give a more prominent and sharper shape to your nose. It will help to uplift your confidence, give you a better look. Beauty no longer is luck but a decision that has to be made by you. One well-known Cosmetic Surgeon who can perform the surgery with much precision is Dr. Milan Doshi of Alluremedspa fame. Dr. Doshi has an experience of over ten years in the field of plastic surgery. He is the Indian Board certified plastic surgeon with international expertise and is a member of International Society of Aesthetic Plastic Surgeon. Allure MedSpa which is renowned for its state-of-the-art internationally acclaimed services, offers value for the you money with cosmetic procedures. To know more about the cost of your procedure request a consult by filling the form below. Your consultation is your chance to ask questions about Rhinoplasty and put your mind at rest. Rhinoplasty costs vary quite a bit depending on several factors: how much work needs to be done; is this a revision procedure; do any additional grafts need to be harvested (ear, rib). Your surgeon will be able to offer you full explanations and answers to all of your queries. The Rhinoplasty consultation is a vital step in the journey to having successful nose surgery. To determine the best Rhinoplasty candidates and the appropriate techniques, there is no substitute for a personal consultation and examination with a board-certified plastic surgeon who is well-versed and experienced in the varied plastic surgery techniques. One day while searching through the internet, I came to know about Dr. Milan Doshi and his venture Allure Medspa. I had some defect with my nose and was searching for an experienced surgeon but at an affordable cost. I made a phone call to them to speak with Dr. Milan Doshi. He advised me to come down to India after evaluating my pictures that I sent to him. I immediately made my tickets for India. I went to Allure Medspa the next day to undergo surgery. Dr. Doshi looked through my face and I was sent for the surgery. I was sent to the surgical room for the surgery. After infusing anesthesia, the surgeon started the surgery. After I woke up after an hour, I saw the difference on my face. My nose shape has become better. People used to tease me for my nose, now that embarrassment is gone. I am advised by the doctor to take proper rest after the surgery and take certain precautions. I will again have to visit India for a follow up. I am very happy with the result. However, there is some swelling for which Dr. Doshi has prescribed some medications. I have become more disciplined now.